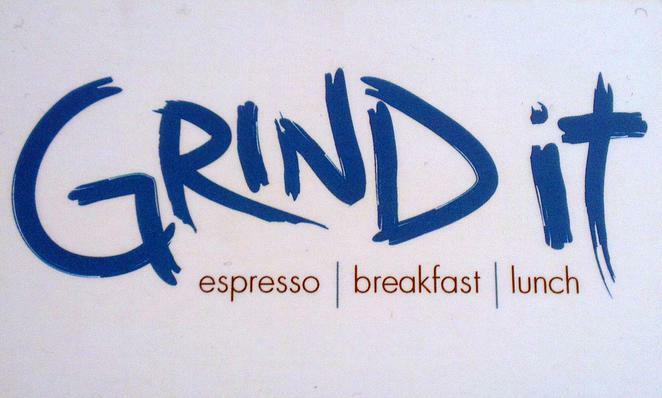 Grind It is a cafe just off Jetty Road at Glenelg that is "serious about great coffee" and specialises in all day breakfast. My friend had been raving about Grind It for some time now and finally took me there on the condition that I kept it a secret so her favourite cafe doesn't become overpopulated. However, after having such a nice time, we agreed that something this good should be shared with the people of Adelaide. The cafe seems to have a large and loyal clientele and it can be difficult to get a seat at times. You see, once you find it, you'll always want to Grind It. Located on Moseley Street, the modest cafe has some blue and white signage but you would be forgiven for walking straight past (as I now believe I may have on several occasions). As far as decor goes there really isn't much to discuss. It is best described as clean and basic, but it's the seating arrangement that sets it apart from many cafes. Against one wall are the comfortable and highly sought after booths, and there are a few tables and chairs by the windows at the front of the cafe offering street views. However, most of the seating is on stools around tall wooden benches that run nearly the length of the room. These aren't very wide and you may find yourself bumping elbows and plates with diners nearby, but it does create a communal feeling and a social buzz. Plus, it gives you a chance to check out the meals around you before placing an order of your own. Even though the cafe was quite busy at the time, the service was friendly and efficient. It didn't take long to be seated, greeted, and ordered. There is a range of magazines and newspapers to flip through while you sip your coffee. Strangely, neither of us are coffee drinkers so I can't comment personally, but most reports suggest the coffee to be excellent. 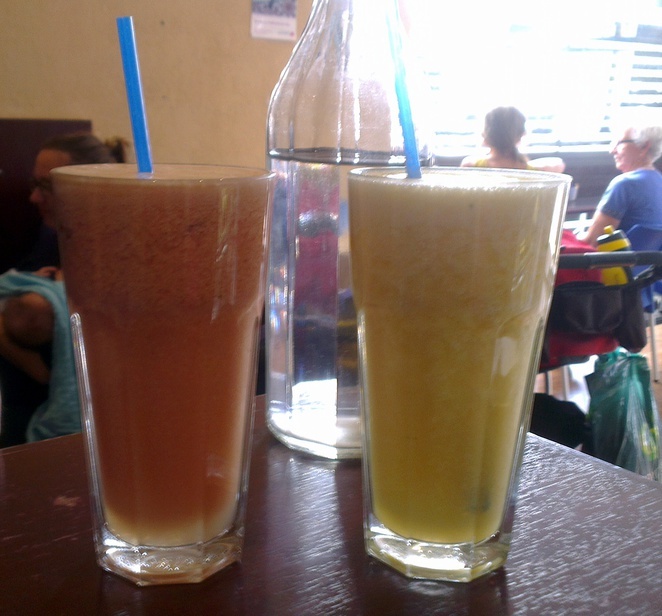 Instead, we began with freshly squeezed juices for approximately $6.50. Choose from apple, pineapple, watermelon, orange, carrot, celery, beetroot, and cucumber, or create your own juice cocktail with a combination of ingredients. You can even add a hint of mint, ginger or lemon. Other than getting a seat, the most challenging aspect of the Grind It experience is deciding what to eat. 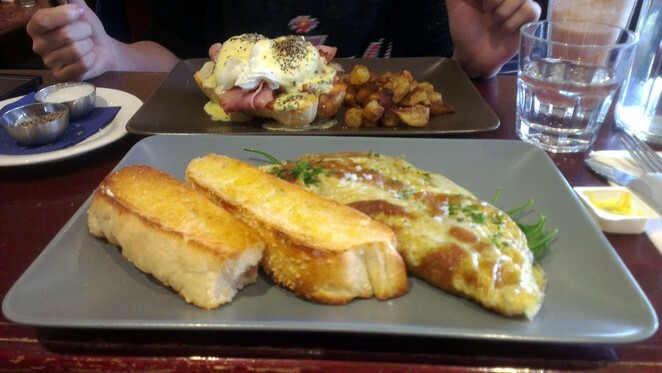 There is much to choose from with an enormous all day breakfast menu or a lunch menu, if that is more to your taste. Best of all, the cafe is vegetarian and vegan friendly. As creatures of habit, we selected our "usual". 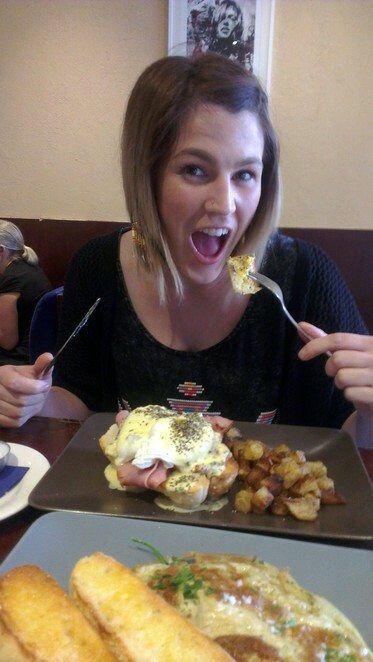 Me, two egg omelette for $9, and she, eggs Benedict for $15. Extras such as baked beans, bacon, grilled haloumi, and a zucchini fritter can be added to your meal for an additional $3 for each item, so we had a generous serve of house hash potatoes and baby spinach. Our meals arrived promptly, fresh, perfectly cooked, and delicious. Perhaps my omelette was greasier than I prefer, but it was full of flavour enhanced further by flakes of sea salt and served with two slices of thick, crunchy Turkish toast. Next time, we promised to try the pancakes and toasted banana bread with compote and yoghurt. But the house-made cinnamon crumpet sounds delicious and the French toast served with pear, mascarpone, and almonds is meant to be a real treat too. The food is fresh and affordable, the service is fast and friendly, there is plenty too choose from, and good news, Grind It is open seven days a week. Find more information and stay up-to-date by liking Grind It on Facebook. 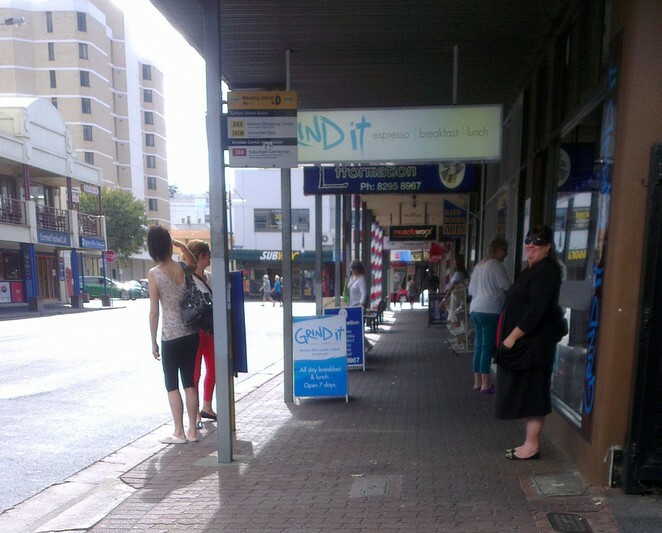 It's a big call, but could this be the best cafe in Glenelg? It's definitely a contender. Try it for yourself and let me know what you think. I'm not keen on communal seating arrangements like that, but the food certainly sounds good. "Grind It" are responsible for getting my son hooked on cooked breakfasts of scrambled eggs & Turkish bread (along with hot chocolate) - delish! I'm so grateful for this cheery place & its great food & hospitality! The coffee, food and service is excellent! I think Grind It Cafe is one of the best Cafe's at Glenelg. It's worth the wait for a table.